This is a continuation of an earlier post about Manila streets. Legarda eventually becomes Pablo Casals Street and then Ayala Boulevard after the Ayala Bridge. There are many prominent academic institutions along the road including the Technological University of the Philippines and the Philippine Normal University. Technological Institute of the Philippines (TIP) has a branch along P. Casals St.
Bridge across a tributary to the Pasig River is full of shanties. This is in the San Miguel district of Manila that is near Malacanan Palace. It is between the Quiapo area and the Palace and the tributary leads to the Golden Mosque to the right. Ayala Bridge where P. Casals Street ends and becomes Ayala Boulevard on the other side of the Pasig. I think the street lamps are quite odd and more decorative than functional. I’ve seen these at night and they look more like lanterns than street lights. At one side of the bridge (on the left in the photo) is the Isla de Balut and the Hospicio de San Jose. Ayala Boulevard is a 4-lane, undivided road. The southwest direction (downstream) leads to Taft Avenue. Just pas the bridge is an intersection with San Marcelino Street, which is part of a major truck route. Along San Marcelino is Adamson University and what was the old St. Theresa’s College Manila campus whose buildings have been integrated with Adamson. 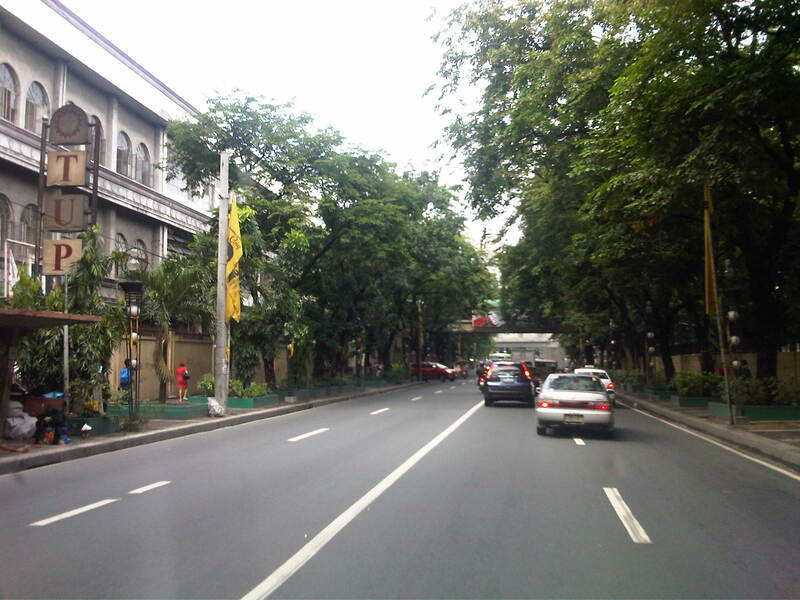 There are two major institutions of higher learning along Ayala Blvd. These are the Technological University of the Philippines and the Philippine Normal University. A bit of trivia: These institutions (TUP and PNU) together with the University of the Philippines (UP) and the Polytechnic University of the Philippines (PUP) formed the pillars of professional and technical education introduced by the Americans to a post-Spanish Philippines. TUP used to be the Manila Trade School (1901) and then the Philippine School of Arts and Trades (1910) under the Americans. The PNU was Philippine Normal School during the American Period (1901) and later became the Philippine Normal College after the Second World War (1949). The PUP was the Manila Business School (1904) and later the Philippine School of Commerce (1908) during the same period. The University of the Philippines was the first state university established by the Americans in 1908. TUP was established to provide education and training in various trades (vocational school). The PUP was established to provide education and training for business/commerce. The PNU was established to provide education and training for teachers. And UP was established to provide education and training to professionals in the fields of engineering, law and medicine. By d0ctrine in Heritage, Highways and Streets, Land use on August 11, 2013 .